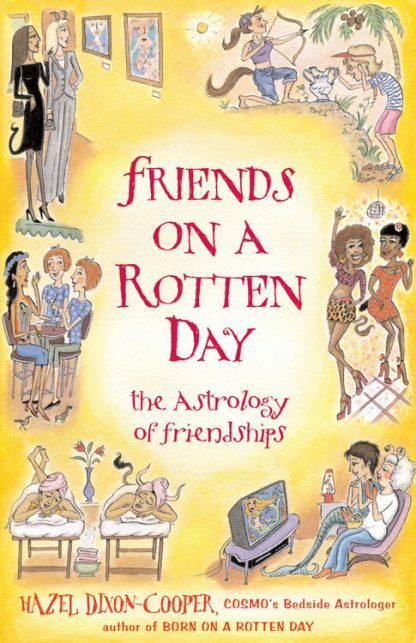 It's about time for Friends on a Rotten Day, the first astrology book to focus entirely on friendships. After all, lovers come and go, but our girlfriends sustain, nurture, and protect us from cradle to grave. Friends on a Rotten Day explores the supportive, uproarious, and sometimes complex, relationships between girlfriends through an in-depth astrological analysis of each Sun sign. Dixon-Cooper shows readers what makes their friend tick on a soul level, revealing each friend's inner character, friendship style, love style (including what to do or not do if a pal picks a loser), and party style. She offers suggestions on the best gifts to buy your friend, how to calm her down, cheer her up, and return the unconditional support and love that she gives you. Readers will discover why their Gemini buddy changes her mind so often, why the Virgo gal pal sweats the small stuff, why a Scorpio girlfriend sometimes seems distant, and why the Leo chum needs frequent headpats. They'll also learn why a Pisces pal should never be forced to make a snap decision, why a Capricorn girlfriend might seem too serious for her own good, the truth about a Taurus friend's hidden anxieties, the competitive side of an Aries chum, what causes Cancer pal's emotional train wrecks, why the Aquarius buddy has a rebellious side, and why the Sagittarius girlfriend has occasional angry outbursts. Hazel Dixon-Cooper is Cosmopolitan magazine's Bedside Astrologer and the author of the internationally best-selling astrology books, Born on a Rotten Day and Love on a Rotten Day. She also writes the daily horoscopes for Cosmo Mobile and can be heard every Friday morning on Wake Up with Cosmo, Sirius Satellite Radio, for the latest celebrity gossip and weekend astro forecast. She is a professional astrologer and a research member of the American Federation of Astrologers.